Great family get away 2 bedroom vacation rental with the vintage style Hawaii ambiance and decor! Please note, we have a 3 night minimum but take 2 nights when there is a 2 night hole, book ended by filled dates. Send us a message and we will respond. Hale Manu, which means the 'Bird House', is our larger two-bedroom guesthouse, privately located in the rear of our property with phenomenal ocean views. The spacious Hawaiian styled architecture includes open beamed, vaulted ceilings, a large center cupola for great airflow, an open floor plan and a large lanai for evening dining under the stars or morning coffee with the sunrise. Over time, we have completely renovated and professionally decorated the home, including a large fully equipped kitchen (a kitchen inventory is available on our website), an all tile bathroom with new fixtures, queen sized beds with high thread count all cotton bedding and teak steamer chairs, gas barbeque and an additional table for dining on the lanai. The ocean facing bedrooms are conducive to romantic sultry evening breezes. We take a lot of pride in our homes, as is evident from the many comments provided by previous guests. Hale Manu is thoughtfully furnished with a fun vintage Hawaiian flair, including a beautifully refurbished 1930's vintage rattan living room set we found and shipped all the way from a small Texas town and original oil paintings by local Hana artists. Sink yourself into the furnishings and grab a book off the bamboo shelves to relax the night away or choose a DVD from the small collection we supply. We also have a collection of coffee table books about Hawaii and Polynesia and, since the home is the “bird house” we have bird books, binoculars for the avid bird watchers. We have done our best to consider all the details, like comfortable linens, nice soaps, whole bean quality coffee and green tea for your first day and for those of you who need to stay connected, we have high speed wireless internet access and unlimited, free mainland United States phone service. We also have the modern conveniences such as a washer/dryer, microwave and more. Hale Manu is perched at the rear of our fully landscaped, two-acre property, providing PRIVACY. Since we live at the front of the property, we work diligently to maintain our homes and provide excellent accommodations. We are also available to answer questions about Hana and steer you in the right direction to your ultimate vacation, whether that means an active time snorkeling, surfing, horseback riding and hiking or just relaxing at the nearby beaches and swimming holes. Hamoa Beach, considered the nicest in town, is just minutes away. We provide snorkeling equipment, beach chairs, beach towels, beach mats, a beach umbrella and a cooler. We can also direct you to local in-house massage therapists or to the local spa for pampering. The Guest Houses at Malanai are named after the gentle cooling breeze, (named Malanai) known for this area of Hana. We are located just 3.6 miles (a five minute drive) outside of Hana Town in the Maka’alae district, which is considered the most highly desired area of Hana. You are sure to fall in love with the picturesque and pastoral landscape, the ever-changing ocean colors and the gentle sound of the waves lulling you to sleep at night. We hope you choose Hale Manu at the Guest Houses at Malanai for your dream vacation in the islands! Please see our website for details on our very competitive rates and policies and feel free to email us with any questions. Our rates vary depending on the season, number of guests and number of nights booked. Please click on the "rates" link for a full description of our rates. We often post specials on our official website. Mahalo! Mary Carol Cabibi and Steven Gayle have been in love with the Hana area for more than twenty years. In 2016 they learned that Chris and Leokane Harrington-Pryor were interested in selling the Guest Houses at Malanai, and by April Mary Carol and Steve had become the new proprietors. They now live on the property with their family. The previous owners purchased this property in 2001 and worked continuously to create a paradise for themselves, their family and friends. In 2005 they began to offer this unique experience to the public. The new proprietors have retained all of the staff, and have maintained all of the landscaping, amenities, and warm aloha that the Guest houses at Malanai have become famous for. Only two of the homes on the large property are available to the public. As one of only three legally permitted vacation rental properties in the area, The Guest Houses at Malanai are often booked months in advance and are well deserving of their consistent #1 rating and stellar reviews. Phenomenal view across from a large pasture and the ocean! Carport under the deck of the house. See our website for a complete inventory. We have many appliances! A small selection of music - Mostly Hawaiian. We also have an Ipod dock. Beautiful ocean views, large deck, jacuzzi bathtub and privacy! It is not "by" Hamoa Beach. It is misleading to suggest that it is. It is in the vicinity, you could walk there, but "by the beach" is an exaggeration. Similarly the place is nice, but I would hardly describe the decor as "impeccable". 1 bathroom for 4 people hardly qualifies as impeccable in my view. No air conditioning when the temperatures are in the 80's can make sleep challenging. I prefer more accurate, less inflated descriptions. You can see the blue of the ocean above the trees in the distance but again "ocean views" suggests more to me than what you find here. There are many other places in Hana where the Ocean Views (including the beaches and expanse of the shoreline) is right outside your door. Not here. 3 stars. No more than that in our view. Suggestion to the owners - be who you are. It's plenty good enough. You don't need to pretend to be something you aren't. I guess "inflated" descriptions are common in real estate but it seems out of place to sell vacation renatls in an environment where you are going to get feedback. This charming place had everything we needed to relax and unwind within the area’s beautiful, tropical surroundings. 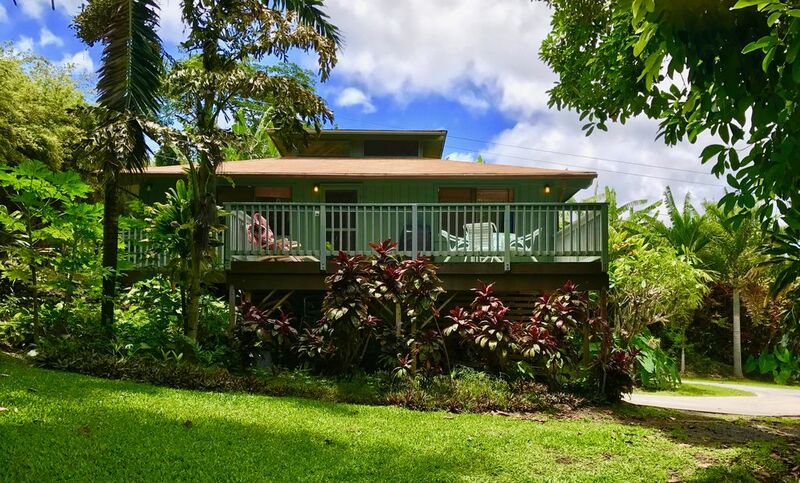 We loved the space, comfort, and view provided, and the property is in a great location,, allowing us to take full advantage of the Hana sites/amenities/beaches and Haleakala National Park (home to the Seven Sacred Pools and a fantastic hike with waterfalls and an amazing bamboo forest). We would definitely recommend to anyone who is looking to stay near Hana (and you should spend some time here). This was the perfect retreat to end my week in Maui. The place is very clean. I thought Hana might have a lot of bugs but I barely saw any at our place. The house is set back from the road but I still woke up to the sound of the waves. Thank you for your visit, you folks were the greatest guests, please do come back again for a longer stay as you mentioned. Property was exactly as advertised and meet all our expectations. We enjoyed two wonderful days and nights in Hana. So much to do and see in the area right around Hana. The property was a great home base to explore from and peaceful place to come back to after each adventure. Fantastic!! Clean with many beautiful touches. We loved the fresh flowers! Amazing sunrises and sunsets! We look forward to returning. Hana is what most people think Hawaii is going to look like. This is not the resort side of the island. Hana is for people who are looking for a true Hawaiian experience, with natural beauty, lush tropical foliage, beautiful beaches and incredible hiking. It's a great place to explore or just sit around and soak up the beauty of paradise while drinking a Mai Tai...Our property is located 3.6 miles south of Hana town in the Hamoa/Maka'alae district and is walking distance to world famous Hamoa Beach and the Venus Pool (Waioka Pond). Our property faces the pristine Hana Ranch coastal pasture and coastline- great for hiking and exploring! On one and two night stays there is an additions $50 taxable cleaning fee. We are a legally permitted vacation rental business TAT# TA-170-361-2416-01 and the County of Maui requires us include a rental agreement with each reservation. It is a brief one page document to sign and return to us. Hale Manu sleeps 1-4 guests. The nightly rate varies depending on high or low season and the number of guests. Here is a breakdown of our rates for Hale Manu: HIGH SEASON December 18 thru April 18 High Season (1-2 guests) 3 nights or more $325 plus tax per night High Season (1-2 guests) 1-2 nights $345 plus tax per night, only offered at last minute or when a 1 or 2 night hole occurs. High Season (1-2 guests) weekly $295 plus tax per night, only offered at last minute or when a 1 or 2 night hole occurs. Additional guests, $25 extra per person up to 4 maximum. LOW SEASON April 19 thru December 17 Low Season (1-2 guests) 3 nights or more $295 plus tax per night. Low Season (1-2 guests) 1-2 nights $325 plus tax per night, only offered at last minute or when a 1 or 2 night hole occurs. Low Season (1-2 guests) weekly $285 plus tax per night, only offered at last minute or when a 1 or 2 night hole occurs. HIGH SEASON December 18 thru April 18 High Season (3-4 guests) 3 nights or more $365 plus tax per night High Season (3-4 guests) 1-2 nights $385 plus tax per night, only offered at last minute or when a 1 or 2 night hole occurs. High Season (3-4 guests) weekly $345 plus tax per night LOW SEASON April 19 thru December 17 Low Season (3-4 guests) 3 nights or more $345 plus tax per night Low Season (3-4 guests) 1-2 nights $365 plus tax per night, only offered at last minute or when a 1 or 2 night hole occurs. Low Season (3-4 guests) weekly $325 plus tax per night If you have any questions regarding our rate, please email us and we can assist you! Mahalo!